The launch will be held on Monday, June 15 from 7 - 8 pm at Restaurant Birseckerhof Binningerstrasse 15, 4051 Basel. The book Double Bind documents conversations between artist Leigh Ledare and art historian Rhea Anastas, provoked by viewing Ledare’s project of the same name as installed at The Box in Los Angeles (2012) and Mitchell-Innes & Nash in New York (2014). Ledare's installation puts in play a series of overlaying comparative structures: it juxtaposes nearly one-thousand photographs of the artist's ex-wife (half taken by Ledare, half taken by her current husband, according to a script conceived by Ledare and enacted by all three), with a large collection of appropriated mass-media materials. In their wide-ranging critical dialogue, Ledare and Anastas probe the complexities of viewing Double Bind’s intimate performances and prolific imagery—from experiences of sensory overload or irritation, to notes of pleasure and humor—enlisting sexual-difference critiques along with a heterogeneous set of cultural and theoretical positions. Arranged in six sections, the dialogue addresses key concepts that structure Double Bind (as well Ledare’s practice broadly): viewing, systemic conditions, enactment, installation and mass media, genealogy, and affect. Installation views of the New York exhibition, taken by Ledare exclusively for this book, foreground the subjective nature of experiencing the work, and anchor the coauthors’ open testing of present-day models of aesthetic and social critique within an ethics of actually looking. The dialogue also appears with an introduction by Anastas, a preface by Ledare, and a chronology of Double Bind exhibitions and publications to date. Art historian Rhea Anastas is associate professor in the Department of Art, University of California, Irvine, and was a cofounder (with Andrea Fraser, R. H. Quaytman, Nicolás Guagnini, and eight other artists and writers) of Orchard, the experimental New York gallery that operated from 2005–2008. 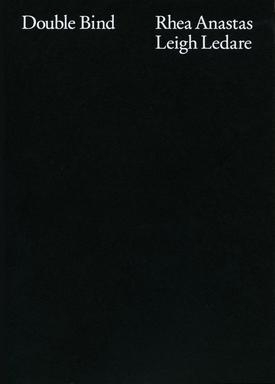 Anastas is author of “Language is the social dress,” included in Josephine Pryde: The Enjoyment of Photography (JRP Ringier, 2015), and numerous other essays and books, including Allan McCollum (JRP Ringier, 2012) and, with Michael Brenson, Witness to Her Art: Art and Writings by Adrian Piper, Mona Hatoum, Cady Noland, Jenny Holzer, Kara Walker, Daniela Rossell and Eau de Cologne (Bard College, 2006). The work of artist Leigh Ledare maps psychosocial relations inscribed within the various orders of photography, language, and public and private social constructions. Ledare’s exhibitions and projects have been exhibited extensively in the US and abroad. Previous publications by Ledare include: Ana and Carl and some other couples (Andrew Roth, 2014), a collaboration with Nicolás Guagnini; Leigh Ledare, et al. (Mousse Publishing, 2012), edited by Elena Filipovic; Double Bind (MFC-michèle didier, 2012); Pretend You’re Actually Alive (PPP Editions and Andrew Roth, 2008); and An Invitation (Leroy Neiman Center for Print Studies, Columbia University, 2012), a photolithography edition. 2015, 6.5 x 9 inches (16.5 x 23 cm), 264 pgs.